The Best Reason in the World to Train. Isometrics for a long life is, in my opinion the BEST reason to train in this physical disciple. Yes Isometric Training will build muscle (articles that here). Yes, Isometrics will make you faster, stronger and reduce your risk of injury (articles on those aspects here). And of course the you'll see improvements in your strength as much as 5-15% per workout...(more on that here) and the results will last over a year without any additional training (more on that here). Most of the great Iai (Japanese swordsmanship) Sensei live well into their late 90's, even the early 100's and still train daily. How? Here we have master Ippei sensei of the Meibukan Okinawa Goju ryu. He's 75 years old and built like a powerhouse. The man is a solid rock of muscle. How? The answer is at the 2 minute 39 seconds mark. 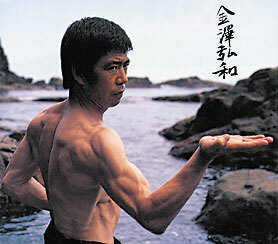 Isometrics for a Long Life - The Secret of the the Sensei's? Are you maintain the isometric tension in the parts that are planted and still? Are you maintaining Isotonic tension as you move from one Isometric position to the next? Are you performing internal isometrics correctly with your breathing? It is in the performance of such a daily discipline that Isometrics for a long life is achieved. By training daily in Isometrics, you build superhuman strength, vitality, energy and muscel that supports you the entirity of your life. Yes, I love my strength, Yes I love being lean and muscular, yes I love being able to physically do what I can do and train in my martial arts, delight my wife with feats of strength, but I want to ENJOY THAT FOR THE REST OF MY LIFE. That's what I do it. Isometrics for a long life. Heck, not just that - I do Isometrics for a long life that is filled with freedom, strength and vitality. This is a great place to start - CLICK HERE. You've been reading Isometric Training for a long life, check out more Isometrics and Martial Arts info here.